The Huawei Mate 10 Pro will be making its way over to US, albeit not under any carrier. While it's welcome news, we're not so sure of how accommodating the device's price tag is. Last night's Huawei keynote at the ongoing CES brought us a number of rather interesting moments, most notable of which was the Huawei's CEO, Richard Yu, passionate speech after the revelation that the Chinese company's deal with AT&T was dead in the water. The only positive takeaway for fans of the company is the fact that the hugely popular Honor 7X has finally been listed on Amazon US. Honor 7X aside, the company will not be relenting in its efforts to sell its smartphones in the US, as the Mate 10 Pro will still make the trip over. Of course, not under the umbrella of any carrier—which admittedly makes it a lot harder to compete—but its something at the very least. Much like with the UK market, the only version of the device that will be sold will be the Mate 10 Pro and the Porsche-branded variant. The regular Mate 10 misses out, sadly, which is a shame, as it's the model with a headphone jack. While it's nice to see Huawei forging on, pricing of both devices isn't exactly the best. The Mate 10 Pro comes with a price tag of US$800, while the Porshe-branded model will sell for US$1225. Those are hefty price tags that compete with the Pixel 2 XL, Samsung Galaxy Note 8, and the iPhone X. Of course, these three devices are sold by carriers and can be bought on long-term plans, while the Mate cannot. 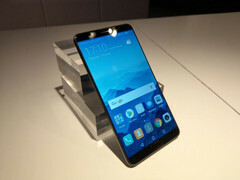 The Mate 10 Pro is sold for much cheaper in China, and while we understand the extra costs associated with VAT and importation as a whole, the listed price for the device is still a tad overwhelming. The Mate 10 Pro will be sold unlocked on online outlets like Amazon, Best Buy, Newegg, Microsoft, and B&H. Local Best Buy stores will have it in stock. It goes on pre-order on February 4, with sales to begin on February 18. The Porsche variant will be sold via Best Buy, Amazon, Microsoft, and Porsche Design shops starting February 18.